Water information is fundamental to national and local economic well-being, protection of life and property, and effective management of the Nation’s water resources. The USGS works with partners to monitor, assess, conduct targeted research, and deliver information on a wide range of water resources and conditions including streamflow, groundwater, water quality, and water use and availability. Surface-water, groundwater, water-quality, and water-use data collected at approximately 1.9 million sites across all 50 states. Learn more about the WMA from Dr. Don Cline, the Associate Director for Water Resources. Explore our science by the topical areas that drive the research and projects conducted by our Programs. 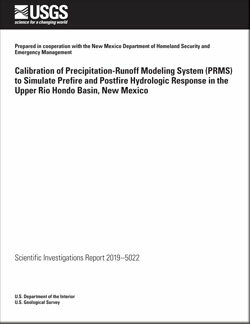 Douglas-Mankin, K.R., and Moeser, C.D., 2019, Calibration of Precipitation-Runoff Modeling System (PRMS) to simulate prefire and postfire hydrologic response in the upper Rio Hondo Basin, New Mexico: U.S. Geological Survey Scientific Investigations Report 2019–5022, 25 p., https://doi.org/10.3133/sir20195022. Clune, John W.; Cravotta, Charles A.
Clune, J.W., and Cravotta, C.A., III, 2019, Drinking water health standards comparison and chemical analysis of groundwater for 72 domestic wells in Bradford County, Pennsylvania, 2016 (ver 1.1, April 23, 2019): U.S. Geological Survey Scientific Investigations Report 2018–5170, 66 p., https://doi.org/10.3133/sir20185170. 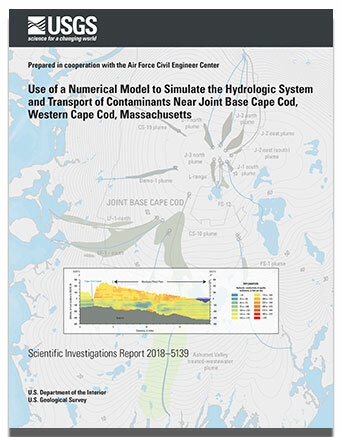 Walter, Donald A.; McCobb, Timothy D.; Fienen, Michael N.
Walter, D.A., McCobb, T.D., and Fienen, M.N., 2019, Use of a numerical model to simulate the hydrologic system and transport of contaminants near Joint Base Cape Cod, western Cape Cod, Massachusetts: U.S. Geological Survey Scientific Investigations Report 2018–5139, 98 p., https://doi.org/10.3133/sir20185139.